5 BR, 6.5 BA, Sleeps 12. Perched high upon the beautiful Sunday River, Maine's Powder Ridge, The Eagle's Nest is one of two spectacular luxury condo units, which comprise The Heights. Nestled in the beautiful and peaceful environs of Maine's vast forest with a magnificent view of Sunday River and its surrounding mountains and valleys, The Eagle's Nest offers its guests a thoroughly untainted and relaxing break from the hectic pace of everyday life. It is the perfect spot for two families vacationing together. The Eagle's Nest is a centrally air-conditioned 4000 square foot multi-level unit, uniquely designed for two vacationing families as it is equipped with three large Master Bedroom Suites, one with its own Private Balcony. The first floor houses the game room, complete with slate pool table, wet bar and an enormous outdoor eight-man hot tub, perfect for stargazing and watching the fireworks from Sunday River on Saturday nights. Added Details:: There is also a cozy nook with a gas fireplace and 65' color TV to watch your favorite movie or sports team. There are two full baths on this level and one four-bed bunkroom. The laundry room is also located here. On the next floor, the main floor, is located a state-of-the-art kitchen, dining room, and living room, all combined in a large open area floor plan with a huge stone fireplace and cathedral ceilings. There is also a huge deck just outside this living area. Outside, we just completed an enormous deck which is the stepping stone to the beautiful new in-ground heated swimming pool and pool house. Amenities:: We have almost every amenity available! For sleeping accommodations, there are 3 master King Suites with private baths and luxury linens There is an enormous game room with a regulation size pool table and a Huge 65' HDTVs with surround sound system. We have central air-conditioning, a stone fireplaces with plenty of firewood, a gas fireplace, and a private 8-man hot tub. In each kitchen, we have a dishwasher, an ice-making refrigerator, a coffee-maker, stove with oven, microwave, and all the dishes and pots and pans you could use! Downstairs, there is a washer and dryer, with an iron and board. We have a large Bose stereo with CD player for use indoors or out at the pool. Microsoft X-Box in each unit. Wireless DSL Internet throughout the house and a Pentium 4 Computer on the Bobcat's side. There are mountain bikes, kayaks and canoes at your disposal. Bed linens and towels are provided. The Great Outdoors! : During the warmer months, kayaking, canoeing, whitewater rafting, hiking, and biking are available. Rent an ATV and go exploring with a guided tour or on your own. Fishing Trips and supplies are available. Go horseback riding, or on a carriage ride. Or moose and animal viewing. Relax and go to the movies. Available for your use at the house will be kayaks, mountain bikes, snowshoes, sleds, and snow tubes. Nearby are a miniature golf course, a huge water slide, shops in historic Bethel, and many restaurants and nights spots. 4 kings, 4 twins, 3 futons. Central Air Conditioning; Sunday River Golf Club membership privileges; high-speed wireless internet access; Chef's Services, daily housekeeping, grocery shopping on request; kayaks; . Great place to come home to after a day of skiing. Spacious living areas and a well set up kitchen. Beds are very comfortable and it’s nice that every bedroom has it’s own bathroom. Some of the shower fixtures need plumbing adjustments but the owner, who is responsive and helpful, is aware of these repairs. We arrived to find the heating was not working and the property was not clean. I rang the owner who sent someone round to fix the heating and change the bed linen. Despite two visits from the heating engineer we never managed to get heat in two of the king bedrooms and the bunk room, and we were offered the use of the adjacent property as sleeping accommodation. This was less than ideal. The master king had not been properly cleaned, the front king had some animal droppings on the floor. The media room had rubbish on the floor. Many of the light fixtures did not work (only one of four in the living room). The hair dryer in the master king did not work. The only can opener did not work. We were unable to close the door on one dish washer. Only one jet worked on the hot tub. There were many other small but irritating problems. To pay so much for such a poorly presented property was disappointing especially as we travelled from the UK for a family holiday. We are so sorry for the issues you encountered. After we sent the cleaning people up to re-clean your rental, they finished with us. We now have an excellent new cleaning staff. We did call you to ask about the heating, but you never responded.... so we thought everything was fine. This is unusual for the rental of the beautiful property. We have not had any issues since. Our group of friends (4 families) rented for 4 nights the week after Christmas. We were 21 people all together (8 adults; 13 kids). We rented both halves of the house and it was really more space than needed. We didn't quite appreciate from the listing that this is essentially two homes in one with two large gourmet kitchens/ adjoining family rooms with fireplaces connected by a set of french doors. There were some minor repair issues (a few burned out bulbs needed replacing; there was spackled drywall awaiting a backsplash over the oven; the dishwashers seemed very new and handn't been fully secured into the cabinetry; a shower nozzle came off in one of the upstairs master bath's; and another master shower didn't seem to fully heat). All this to say it looks like this very large property is still coming together and is about 95% there. The hot tubs were in good working order and managed to stay hot in sub zero temps. Win! There was plenty of large, comfortable seating in the common areas/ around the fireplace and long dining tables with plenty of chairs-- again, great for large groups. The owners are accommodating and very enjoyable to work with. 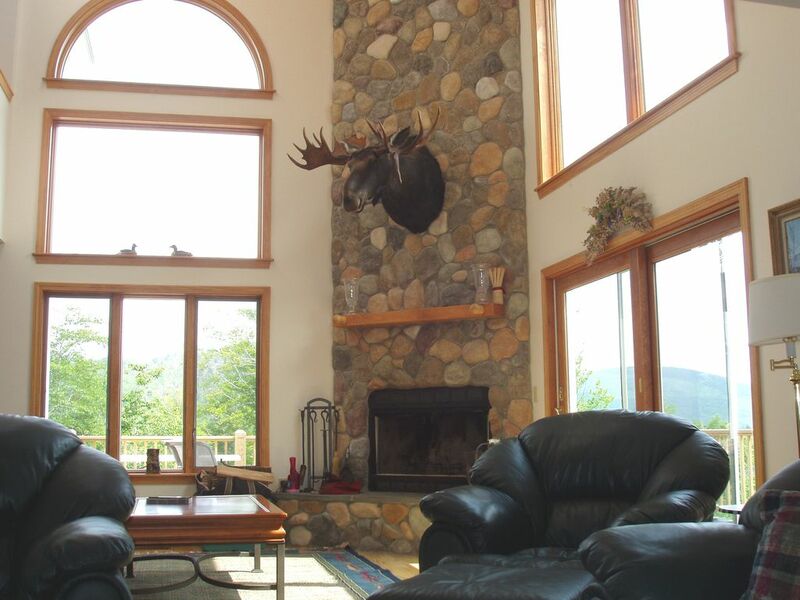 As there aren't many reviews from ski travelers on this home I think it's helpful to know this is a great option for groups skiing Sunday River who don't mind staying off the mountain. It's just a ten minute drive and even in arctic conditions all the roads between were well maintained. There's a large mudroom for boots and gear. And we loved having the wood burning fireplace which was generously stocked with plenty of seasoned firewood. The views are beautiful, the beds are comfortable. We recommend highly. We and three other families rented The Heights, which is comprised of the Eagle's Nest and another unit. The home was absolutely beautiful, as accurately depicted in the online photos. All 17 of us - 8 adults, 9 kids - fit easily, and we could even have added another family of four. The kitchens were well stocked with dinnerware, utensils, cookware, and appliances. The theater room functioned properly and comfortably fit all the kids at once. The pool and poolhouse were wonderful - too bad it never felt so warm that we needed to escape to the poolhouse. Gourmet in a Pinch was a real highlight for us. The owner recommended them, and she was right. They cooked a Mexican Fiesta one night, and lobster dinner another. The food was fabulous, reasonably priced, and the luxury of not having to cook or clean was a real treat. The owner, Paul, was charming and clearly passionate about his work. Bravo! The area of Bethel/Sunday River was gorgeous, with scenic mountain views, drives and hikes. The activities were nearby and plentiful, including white water rafting, swimming holes, golf, ziplines, hikes, and even some shopping in Conway on a rainy day. Plan dining and activities carefully because the resort is winter-focused, and some places close completely or for part of each week. The owner, Susan, couldn't have been more gracious and helpful before and during our stay. Like any large, rental at the end of a busy season, there were a few minor items that I'm sure she'll attend to - one hot tub was out of order and none of us could get the sauna turned on. Those were minor compared to the overall excellent experience. We would highly recommend it,, and would happily return there in the future. Our stay here was absolutely incredible. The home owners were very gracious and welcoming. The house is the perfect location for a relaxing retreat from the hill. The hot tub was great especially the first night when it was -27 C (-16.6 F) ... We didn't use the theatre or even turn on a TV .... Hit the slopes all day .... Relaxed by the fireplace in the night with wine, beer, and appies .... We brought a lot of food with us but next year when we return I would really recommend ordering your food from "Gourmet in a Pinch" ... A local catering business that has great food and even better prices. Overall, we loved this place and are planning on returning every year for a week. We wanted to tell you how much we loved staying at your home in Maine. The accommodations were wonderful and the scenery beautiful. What a peaceful way to wake up every morning and see the magnificent view. You couldn't help but relax, which is what we all needed. Your home was so warm and inviting and you had everything we could possibly need. You are always a little nervous when you pick a place to stay in an area where you have never been before, but you helped alleviate those concerns. Thanks for all of your help as we asked questions upfront, coordinated the stay with us, provided information, and even Arthur's call on Friday night to make sure we had everything our first day there. It was a pleasure. We are definitely fans of Maine now. The Sunday River/Bethel area offers a vacationer many options for outdoor activities. Included is, of course, some of the Northeast's best snowboarding, snow tubing, and skiing, both downhill and cross-country, as well as ice-skating, snow shoeing, sledding, dog sledding, sleigh rides and skimobiling. During the summer months, kayaking, canoeing, whitewater rafting, hiking, and biking are available. The Sunday River Golf Course with design by Robert Trent Jones, Jr. will become one of your favorite destinations when it opens in the Summer of 2004. Rent an ATV and go exploring with a guided tour or on your own. Fishing Trips and supplies are available. Go horseback riding, or on a carriage ride. Or moose and animal viewing. Relax and go to the movies. Available for your use at the house will be kayaks, mountain bikes, snowshoes, sleds, and snow tubes. Nearby are a miniature golf course, a huge water slide, shops in historic Bethel, and many restaurants and nights spots. Ski: The Sunday River/Bethel area offers a vacationer many options for outdoor activities. Included is, of course, some of the Northeast's best snowboarding, snow tubing, and skiing, both downhill and cross-country, as well as ice-skating, snow shoeing, sledding, dog sledding, sleigh rides and skimobiling.